Living in the Happiest Town in the U.S.
What makes the area so great isn't what is bought. SLO's greatness resides in memory. In the last ten years, I graduated from undergraduate and gradate school, found a career in design, said goodbye to both parents, fought cancer and existed with utmost optimism and pride for my home here in SLO. I love it here. I could live here the rest of my life and be happy with that decision. People may be the reason for home, but having a sense of place is the core of community. One must be active in the community to tap into the vein of what makes a great place. To really get SLO, you need to participate in SLO. What makes SLO the happiest place has nothing to do with staying at the Madonna Inn. We acknowledge Alex Madonna left a massive footprint in the city, his inn on the hill is iconic. It's a place where most locals have been a handful of times. Hell, last time I used the famous waterfall urinal, I was mid-stream when surprised by a fleet of middle-aged women walking in with camera phones at hand. It's honestly not that cool. But hell, us locals tend to avoid the inn for the most part. The food there? Eh. I've had a couple greasy spoon meals at the Copper Cafe that were fine, and I'll indulge a piece of famous Madonna Inn cake from time to time, but that hotel--any hotel--is not what makes SLO thrive. It's certainly not the reason to visit this area. Readers Digest claims SLO folk live within the top-four happiest places on Earth. The weather isn't the only thing offering year-round brilliance. What makes SLO so unique? What is this city doing right? I'll get to the famous Thursday night SLO farmers market in a proceeding section below. Though the market usually ties onto other local happenings. SLO throbs with live music. 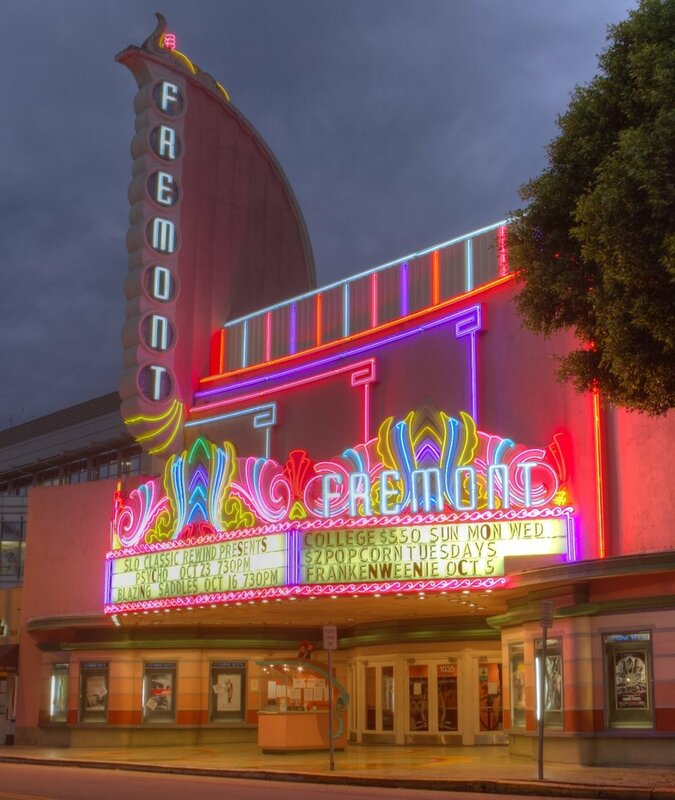 There are great venues like the Fremont where locals walk in from surrounding neighborhoods and catch a touring act paired with exceptional local talent in a traditional art deco facade. The venue offers pristine sound and not a bad seat in the house. SLO is one of the few places on the Central Coast where a person can catch live jazz. When provided an opportunity to hear some live local SLO jazz, do yourself the favor. One can wander from the Fremont to a free show at Luna Red, Frog & Peach Pub, SLO Brew, and sometimes Mission Plaza. The Mission at San Luis Obispo regularly holds events like the massively popular and always fabulous Central Coast Pride in the Plaza, the SLO Jazz Festival and a free weekly summer-long series of Concerts in the Plaza. People show up to these events in troves. Just on the perimeter of downtown resides the majestic Christopher Cohan Center at Cal Poly SLO. Catching a symphony, stage show, or concert here is always spectacular due to the excellent acoustics, splendid interior and only good views of the stage. It's been noted that most commutes in the SLO area are less than ten minutes. It's one of the reasons why long time locals have great reservations with big cities, spending less time in our vehicles is a real luxury--benefiting that which is most valuable to oneself, our time. This isn't just because SLO has a relatively sane view on passenger vehicles, discouraging their downtown use with hefty parking fees and reduced parking duration limits. Many who live in the city commute by walking or bicycling. One of the most entertaining events on the Central Coast is SLOs Bike Night, the first Thursday of every month, happening right after farmers market. The biking community in SLO is huge. The city bares the highest bike commuting percentage in the county at nearly 8% ridership. But it's a tragic truth that SLO ranks first or second in bicycle-related collisions each year since 2008 for California cities of a similar size (populations between 25,000 and 50,000). Nevertheless, SLO has adopted a number of progressive transportation designs to help provide more facilities and improved safety infrastructure (e.g. sharrows, bike boulevards, bike-only signals and intersection detection, etc.) for the growing SLO bicyclist population. There are also excellent public transportation options, Uber, Lyft and other vehicle sharing platforms available. But almost everyone I know walks in-town. Most of us enjoy the night scene, catching a concert in the plaza, film at the Palm Theatre, or a couple drinks at one of the many casual restaurants, bars or tasting rooms. There's a style suited for anyone's taste in watering hole. You also may roll in by train, get dropped off at the station and walk downtown to find a hotel. That's a truly under-appreciated great thing about SLO. The access and affordability of the Pacific Surfliner train is perfect for people coming in from other parts of the state. I've written extensively about SLO food, everything from food trucks, Mexican food, to our favorite pizzas. The best SLO food is found in the restaurants maintaining the farm-to-table philosophy, where you aren't paying for the 500 mile Caesar salad. Instead you're paying for ingredients from a single local farm. There are twenty farmers markets in SLO county, the most popular is SLO's Thursday night six-block Higuera Street farmers market. It's as shoulder-to-shoulder full as it was a decade ago. These days, I tend to visit the farmers market only when I need produce. Gone are the high school years and early twenties where the SLO farmers market was the place to be seen by your peers. It's no surprise that SLO is a college town. At least eight months of the year SLO's population swells by fifty percent as the student body returns from summer break. Students are present during summer school, but the campus shrinks considerably as most students head off to internships, home and travel. SLO students unsurprisingly tend to a bad rap from the locals. The local and student attitudes are sometimes adversarial, as community-scale events have been decried by locals due to the infamous Poly Royal and Mardi Gras Riots which led to dramatic overhauls in University policy regarding student conduct on and off campus. Nevertheless, those tales are massively eclipsed by the benefits of having one of the US's best undergraduate engineering programs in the country in the city. Poly students flood the city with not just economic value, but also innovation. Current and former students continue inject SLO with progressive visions of community pride, public safety, aesthetics and culture. I remember in grad school I had the opportunity to present my term project unveiling to the mayor. The mayor actually showed up to university events. This left an impression on all pushing through the grad school grind. It was great doing research in a community that sought the help and valued the perspective. The most important civic marquee, culture, sustains with investment. Los Osos, the artist community west of SLO was once the sole coastal bastion for art and community. These attitudes seemed to have radiated from Los Osos outward to foster the same ideals within the larger county. SLO today holds tight its vision of lasting community, with ecological easements, historically designated buildings, atypical city districts (e.g. China Town, Railroad District, the unofficial Mojo District, etc.) large greenbelts, multi-purpose trails and conserved land keeping development at bay, or at least marched onward tactfully. Unlike some of adjacent cities which have lost the vision for tight-knit community, sidelined instead for potential sales tax revenues and hefty developmental impact fees. Development should never be hurried. It should plod along at a gentle pace, with all considerations for the community taken in highest regard first. To build spaces that benefit the community, because in the end it is the community that will be left with these structures, regardless of property owner will. Most who visit the area come to taste our wines, craft beers and dip their toes in our beaches. To experience a moment for what living in this town is like. Sometimes it feels like Pleasantville, how weather is almost always fair and the narrow streets are lined with plump California bungalows, Victorian pseudo-mansions and overgrown canopies shading the sidewalks. Couple that with the low crime, how everyone bikes and talks to his or her neighbor and you'll approximate this funny place. It probably doesn't come as a surprise that SLO is the sixth least affordable place to live in the US. I don't know what living unlimited means, but I know that life is a strangely extraordinary and delicate dash. The tide at times feels relentless. You find a way to dig your heals in, put the roots down seek an existence living where you vacation and continue to be inspired. Having extraordinary people in your life is the ingredient often neglected in these kinds of pieces. I'm lucky to have my SLO family. Every year it grows and becomes more genuine.